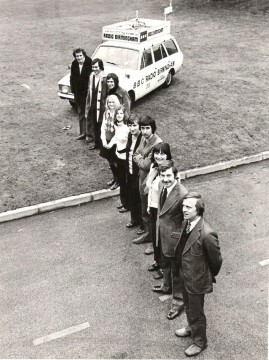 The photo shows the Radio Birmingham, Radio Car. It probably dates from the mid 1970’s. The line up is made up of the station’s news team. According to producer/presenter Pete Simpkin, it includes (L to R): Chris Phipps,Stuart Woodcock, Nick Owen, Angela Jameson, Annie Gumbley, Jim Rosenthal, then the late Andy Roberts news producer, a newsroom Secretary who’s name escapes me,Roger Moody and Martin Henfield. Angela Jameson was the Newsroom Secretary and married to the Warks cricketer John Jameson. Martin Henfield went on to become News Editor Radio Birmingham, Roger Moody went to satellite TV. Thanks to Annie Gumbley for making the photograph available.